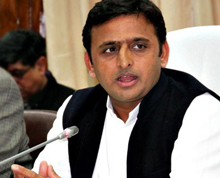 As many of our readers follow the Uttar Pradesh news religiously, we present the latest Uttar Pradesh news for those of you who avidly follow emerging news from Uttar Pradesh updated to the minute. Do send us a feedback on the quality of Uttar Pradesh related news served to you, so that we can make it better for you. Kanpur, April 19 (IANS) Congress General Secretary Priyanka Gandhi on Friday accused the Narendra Modi government of politicising the Armed Forces by calling the one rank one pension (OROP) a favour to them. View More..
Dehradun, April 19 (IANS) Two elephants were killed after they were hit by a train in Jwalapur area of Haridwar district early on Friday, a forest department official said. View More..
Lucknow, April 19 (IANS) Gorakhpur, Phulpur, Kairana and Noorpur continue to haunt the Bhartiya Janata Party in Uttar Pradesh even as the party leadership insists that it is returning to power with a bigger majority. View More..
Kanpur, April 19 (IANS) Congress General Secretary Priyanka Gandhi on Friday drew huge numbers of Congress supporters out on the streets as she kicked off her road show in this Uttar Pradesh industrial city on Friday. View More..
Amethi, April 19 (IANS) Congress General Secretary Priyanka Gandhi Vadra on Friday held marathon meeting with party workers and the senior leaders of the BSP and the JAP in Gauriganj, the district headquarters of Amethi, on Friday. View More..
Mainpuri (Uttar Pradesh), April 19 (IANS) Former Uttar Pradesh Chief Ministers Mulayam Singh Yadav and Mayawati on Friday erased 24 years of bitter hostilities and shared the same platform in Mainpuri where the BSP President took on Prime Minister Narendra Modi while the Samajwdi Party patriarch declared that this will be his last election. View More..
Lucknow, April 19 (IANS) A Dalit man, who accidentally cast his vote for the Bharatiya Janata Party (BJP) in Uttar Pradesh's Bulandshahr, has chopped off his index finger for the "mistake". View More..
Mainpuri (Uttar Pradesh), April 19 (IANS) Former Uttar Pradesh Chief Ministers Mayawati and Mulayam Singh Yadav on Friday shared a stage for the first time in 25 years where they blasted Prime Minister Narendra Modi as the Samajwadi Party founder declared that this will be his last electoral battle. View More..
Lucknow, April 19 (IANS) Ashok Chandel, the BJP MLA from Uttar Pradesh's Hamirpur district, was on Friday sentenced to life imprisonment after he was found guilty in a 22-year-old murder case. View More..
Mainpuri, April 19 (IANS) Former Uttar Pradesh Chief Ministers Mayawati and Mulayam Singh Yadav on Friday shared a stage for the first time in 25 years where the BSP chief praised the Samajwadi Party founder and dubbed Prime Minister Narendra Modi as "a fake backward". View More..
Dehradun, April 19 (IANS) More than a month after a couple in Uttarakhand refused to accept a newborn girl as their own, insisting that a boy was born to them, DNA tests ended the suspense proving beyond doubt that the baby belongs to them only. View More..
Amethi, April 19 (IANS) Congress General Secretary Priyanka Gandhi Vadra will hold a party workers meeting in Gauriganj, the district headquarters of Amethi, on Friday ahead of her roadshow in Kanpur later in the day. View More..
Mainpuri, April 19 (IANS) Samajwadi Party founder Mulayam Singh Yadav and Bahujan Samaj Party chief Mayawati will share a stage at a joint rally of the SP-BSP-RLD alliance in Uttar Pradesh's Mainpuri on Friday, putting aside historical grievances of their shared past. View More..
Badaun, April 18 (IANS) Congress President Rahul Gandhi on Thursday attacked the Samajwadi Party (SP) and the Bahujan Samaj Party (BSP), saying they are scared of Prime Minister Narendra Modi and they caused immense damage to the state during their rule. View More..
Lucknow, April 18 (IANS) Congress general secretary Priyanka Gandhi Vadra will hold a road show in Kanpur on Friday, party leaders said on Thursday here. View More..
Lucknow, April 18 (IANS) Eight Lok Sabha constituencies that went to polls in the second phase of polling on Thursday in Uttar Pradesh recorded an average voter turnout of 62.30 per cent till 6. p.m., according to the Chief Electoral Officer (CEO). View More..
Lucknow, April 18 (IANS) In an unexpected move, Congress president Rahul Gandhi on Thursday mounted an attack on SP and BSP, saying the two along with the BJP had destroyed Uttar Pradesh. View More..
Ghaziabad, April 18 (IANS) The dead body of a man was found wrapped in a trolley bag here. View More..